This is a big welcome to Acorns On Glen’s “Charleston, South Carolina Vacation Review” festivities! Yes, we are back from our vacation to Charleston and the beach on Kiawa Island and we are ready to show you some of the highlights of our trip. First off, we were in South Carolina when news of Hurricane Irene started. We did fly back to Connecticut before the hurricane hit land and we were impacted on Glen Road when it hit Connecticut on Saturday evening. Most of our town is still without electricity as of today, but everyone we know is safe and sound (just a little cranky at this point). To all of you that were impacted by this storm, we hope that you and your families are doing well. Let me tell you this. I have learned in my life that when expectations are low, you usually have one of the best times of your life. An example, when Les Miserables was a hot play on Broadway, I bought tickets. I was so excited to see this show. All of my friends that knew I was going called me and told me that I was in for a treat. It would be the best show I ever saw in my life. My expectations were super high. I went to the show and, guess what, I left at intermission. I mean, come on, how long can that revolution go on? Shoot your guns and die. Get it over already! It’s the same with our trip to Charleston. One of my best friends (love her) and her husband (who I’m crazy about as well) take their kids (love them too; an all around super-duper family) down to Charleston and then a drive over to Kiawah Island (about 30 miles east of Charleston) for some beach time. She knew that we had not had any vacation this year and knew that we didn’t have any plans and so she graciously offered for us to travel down to SC and be a part of their vacation. She also knew that our saying “yes” was dicey because of the points listed above. After a lot of persuasion from my dear friend, we said yes. I set expectations low in my mind….thinking it was better to get away to a place that you probably wouldn’t like versus not going away at all. In my experience, low expectations usually produce the best times of your life and this was the case here. What a week of great fun! To anyone that is ever on the fence about going to Charleston, I have to tell you to just pack your bags and get down there. From history, architecture, GREAT food, nice people and a great opportunity to relax, Charleston has it all. For me, Charleston will always be remembered for great food. Because the landscape is marshy and swampy, they refer to their cooking as low country. The food that they produce is down home, comfort food and I believe that it is similar to the food I grew up with in Iowa, where the cooks in Charleston work very hard to take the ingredients that they have and work to develop the best taste that they can with the simple ingredients that are present. So to give you an example of this, I thought I would start our vacation review festivities with a recipe for Pimento Cheese. To make this Southern classic, I turned to Matt Lee and Ted Lee, two brothers that have brought Southern cooking to life with their cookbooks. 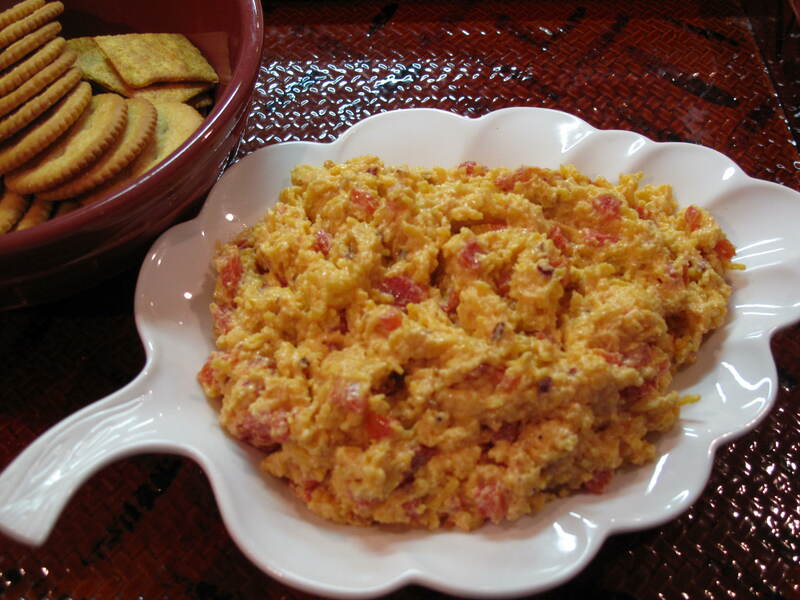 I turned to their first cookbook, ‘The Lee Bros. Southern Cookbook’, to help me make my Pimento Cheese. 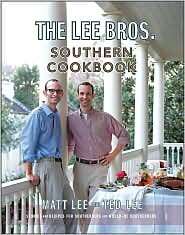 This cookbook by the Lee Brothers is fantastic for a would-be Southerner like me. It won the James Beard Foundation Cookbook of the Year Award for Food of the Americas in 2007 and is as fun to read the stories as it is to read the great Southern recipes. It is my newest addition to my vast cookbook collection. Halfway through my visit to Charleston, I saw it in a shop window and looked it up on Amazon.com that night and knew that my new-found lust for Charleston made this a must for my collection. So let’s have the Lee Brothers take it over and let’s make this Southern classic, Pimento Cheese. The Lee Brothers say that there was a time when you could eat pimento cheese sandwiches at lunch counters throughout the South. Today, you are more likely to find this orange spread of sharp cheddar and mild pepper served as a dip, on crackers, in someone’s home during cocktail hour. That’s how we enjoyed our dish of Pimento Cheese over the weekend. 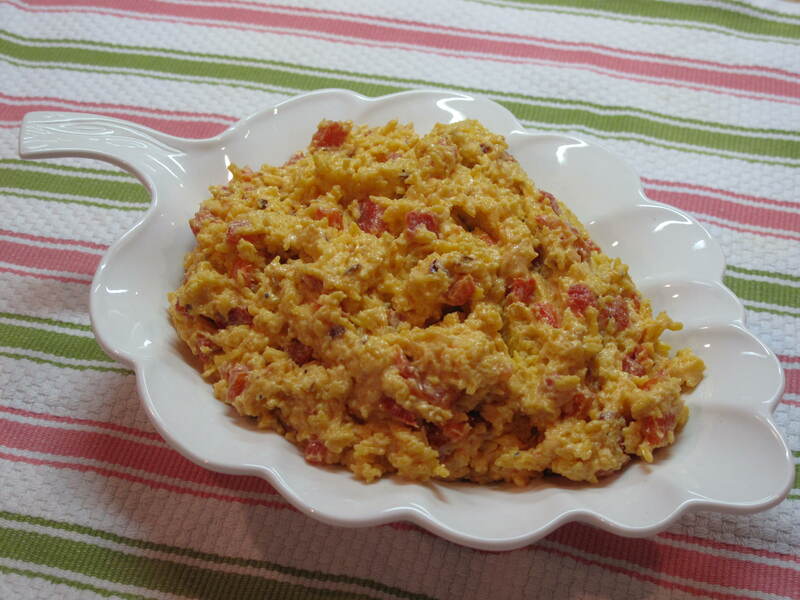 Traditional recipes for Pimento Cheese call for canned pimentos, but this recipe broils a fresh red bell pepper, removes the blackened skin and then cuts the pepper into small dice before mixing it with the cheeses. The Lee Brothers do admit that some of their Charleston friends roll their eyes that the recipe uses red pepper versus pimentos, but they believe it is a simple route to a more vibrant and sophisticated (and less chemical tasting) pepper flavor. 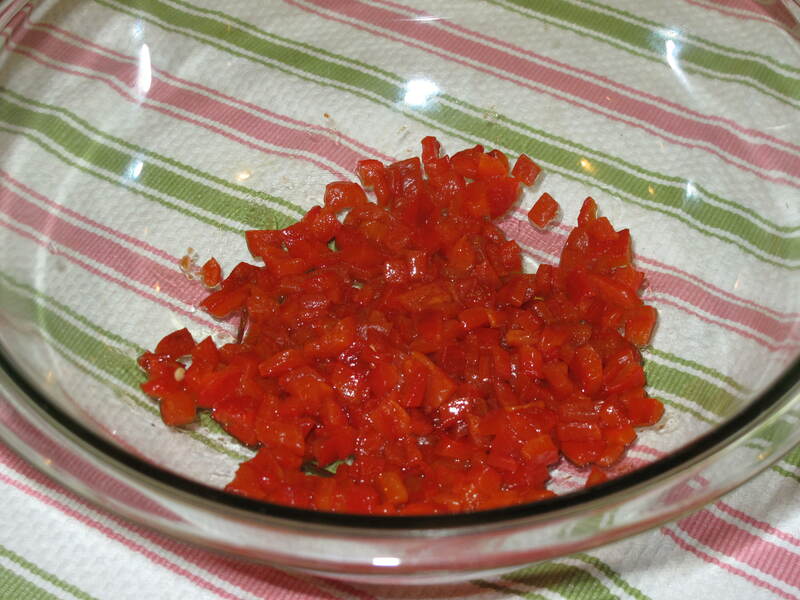 If you are a die-hard pimento lover, you can feel free to replace the pepper with 3 1/2 ounces of pimentos, but make sure that you dice them finely so that they get distributed throughout the spread. Turn on the broiler. Place the pepper on its side on a dry cookie sheet and slide it under the broiler until the skin blackens on the side facing up. With tongs, turn the pepper so that an unblackened side faces up and repeat until the skin is blackened on all sides. Place the pepper in a small bowl, cover it with plastic wrap and let it steam for 5 minutes as it cools down. Uncover the bowl. When the pepper is cool enough to handle, transfer it to a cutting board, reserving any liquid in the bowl. Remove the blackened skin with your fingers and discard. Using a paring knife, cut the pepper in half, remove and discard the stem and the seeds and chop the pepper into 1/4-inch dice. You should have about a 1/2 cup. 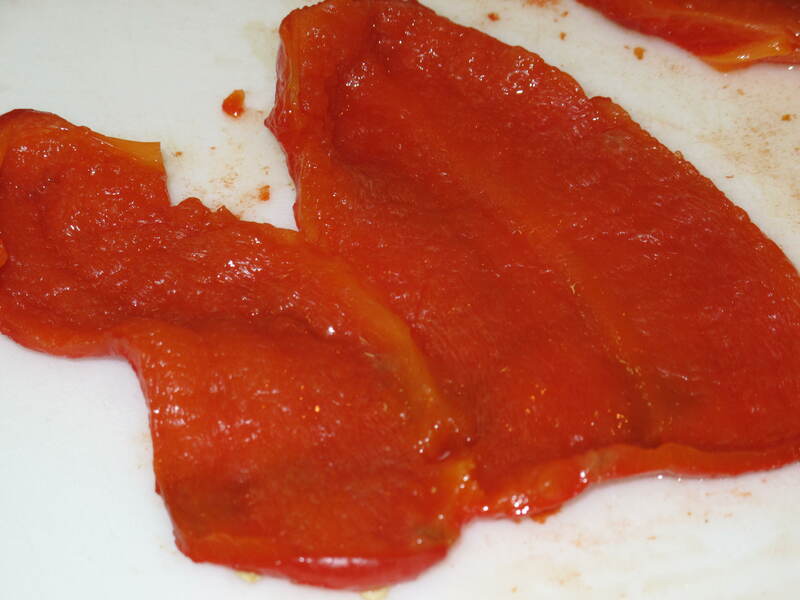 After chopping, you have to admit that these peppers do a pretty good job impersonating pimentos. The choice is yours, but I have to think the Lee Brothers know how to make some good Pimento Cheese. You be the judge and do what you need to do. Place the grated cheddar in a medium bowl and add the cream cheese pieces, the mayonnaise (homemade version coming up), the diced red pepper and its liquid and the red pepper flakes, distributing them evenly over the cheese. With a rubber spatula, blend the ingredients together until the spread is thoroughly mixed, about 3 minutes. Season with salt and pepper. Note that Pimento Cheese keeps in the refrigerator for 1 week. Are you adventurous? 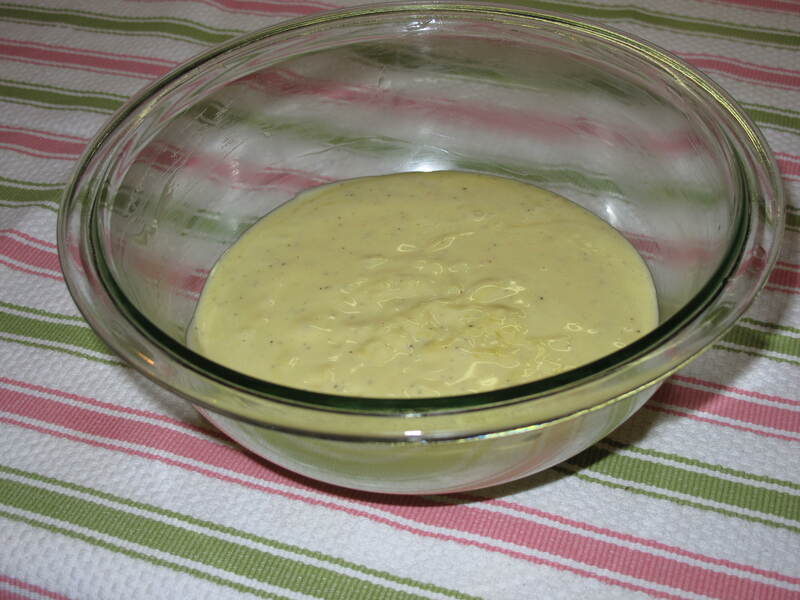 Here is the homemade Lemony Mayonnaise that I used in my Pimento Cheese recipe. This takes less than 5 minutes to make. Give it a try. In a small bowl, whisk the egg yolks with the lemon juice. Add the oils in a thin stream, whisking constantly to emulsify. When the mayonnaise is thick and consistent, add the vinegar, salt and pepper and whisk vigorously to incorporate. Store in the refrigerator up to 2 days. This is my new favorite dinner party appetizer dip. If you are really trying to get back to your Southern roots, spread this Pimento Cheese on some white sandwich bread and enjoy a sandwich for lunch. Thanks so much to the Lee Brothers for this delicious recipe and please buy their great cookbook. This is just the start of our Charleston, SC vacation review. Come back to enjoy more of this jewel of a city. We have more stories….from hats to our hotel to restaurant fun. Come back and visit us, y’all. Have you ever visited Charleston, SC and what did you think? A Picture Is Worth A Thousand Words – Phlox You! This is one of the remaining blooms in our garden. 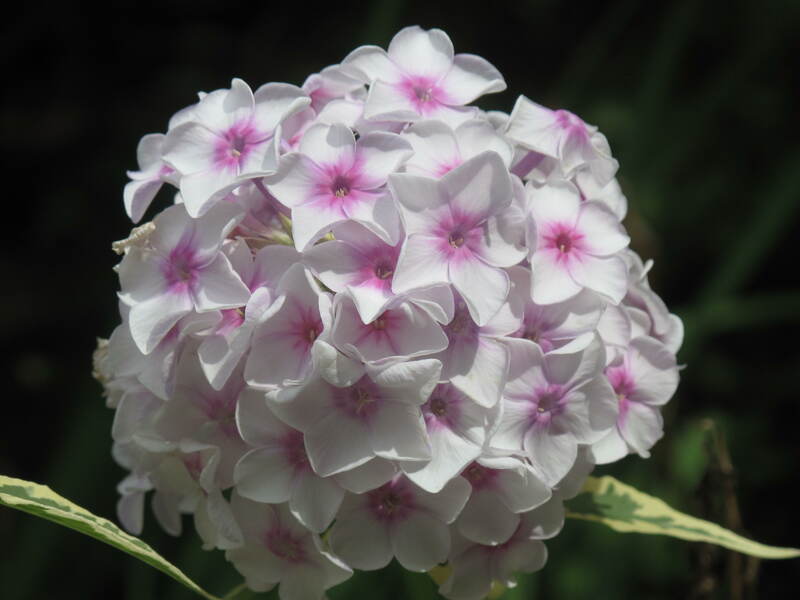 How lovely is this Phlox bloom with its white flowers with intense pink centers? We have had a lot of rain over the last week. There were several fronts that moved through the Connecticut area that dumped quite a few inches of rain. While you would think all the rain would be great for our plants, in most cases it just served to destroy any remaining blooms that were left in the garden. A nice bloom takes a beating in heavy pouring rain! So while most of the blooms were destroyed, this Phlox bloom held tough and is about all that remains in our garden. How has your garden been doing in all this crazy weather we have been having? This is where we will be through August 29th. We will try to post a few stories, but for the most part, we will just be laying on the beach in South Carolina. Have a great rest of your summer! 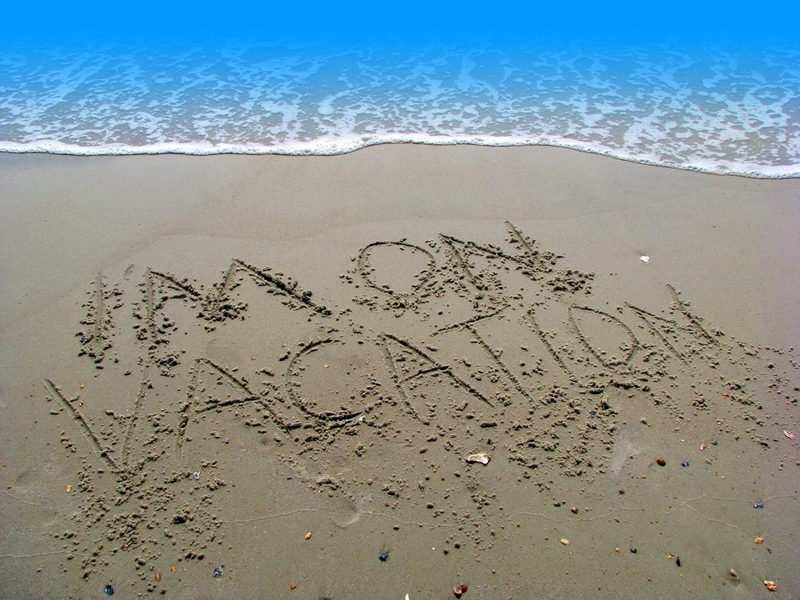 Where are you going for vacation this year? This week’s song is what I’m thinking of doing on Saturday of this weekend…nothing at all. It’s been a really rough week at work as my company had one of its official ‘closing of the books’. This is the time when we close all of our systems and take a look at the numbers. This means we see either how much we made or didn’t make to our profit forecast. Given the rough economic times, you can understand the pressure people are under to ensure the company stays profitable. So besides doing the work, there are lots of questions and concerns that every department raises that you need to answer. Bottom line, when you are finally done with the week-long close process, you have devoted some late nights and have been under some wild pressure. So what’s the best way to get back on track? Chill out on one day over the weekend. So, just like ‘The Lazy Song’ by Bruno Mars, Saturday is the day where I’m not doing anything….nothing at all. I’m just re-charging, re-fueling and re-laxing. Sounds great, huh? So let’s get back to Friday. You’ve made it through another week and deserve to celebrate this fact. 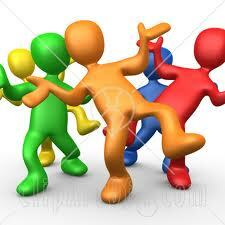 Turn up your speakers and dance. Get some rest this weekend too. What are your plans for this weekend? This is a great way to make stuffed artichokes in a quick and dirty manner. There is the traditional way, which involves clipping and trimming whole artichokes, stuffing them and then steaming them for a long period of time until they are tender and then there is this way. I’ll admit that the traditional way is best, but when you are in a hurry, nothing impresses more than this quick stuffed artichoke treat. I have modified this recipe from one that I found in an old Italian cookbook. Remember, I’m not keen on lemon so I took the lemon juice amount down and I also brought the amount of breadcrumbs down as well. Because we are in a hurry on this dish (remember? 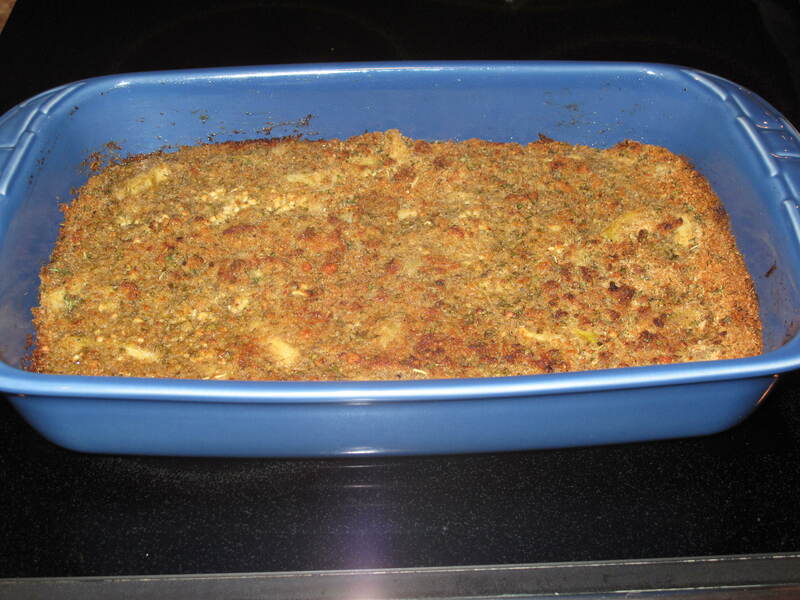 ), I used store-bought seasoned breadcrumbs and not ones that I make myself. GASP!…I can hear it now….forgive me food gods. Since I am in the confessing mood, I also used bottled artichoke hearts from the Italian section of the supermarket instead of fresh artichokes. THUD!….the foodies that didn’t quit reading after the breadcrumb disclosure are now picking themselves up off the floor. I think this is a good recipe. Again, there are days when you have all the time in the world to cook and there are days when you need something quick, yet homemade. This is one of those dishes. Preheat the oven to 325 degrees. 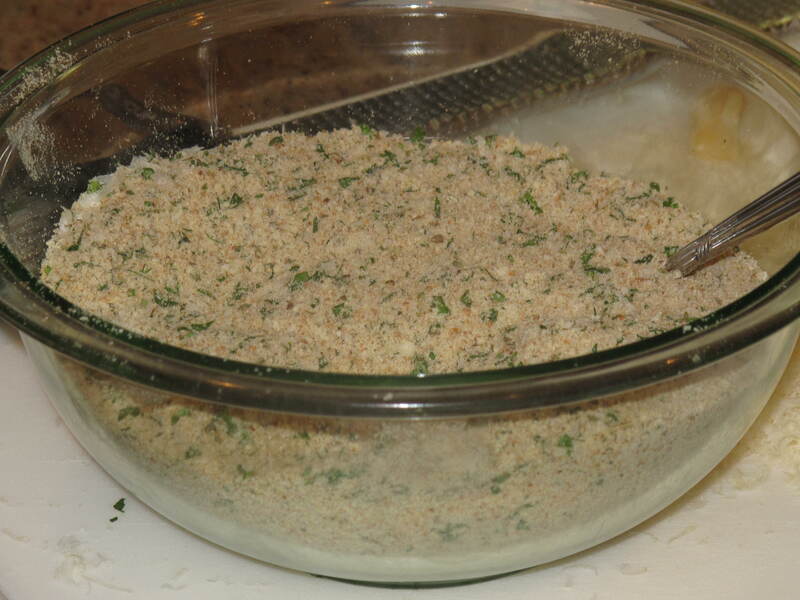 In a medium bowl, mix together the breadcrumbs, parsley, cheeses, dried herbs, salt and pepper. Set aside. 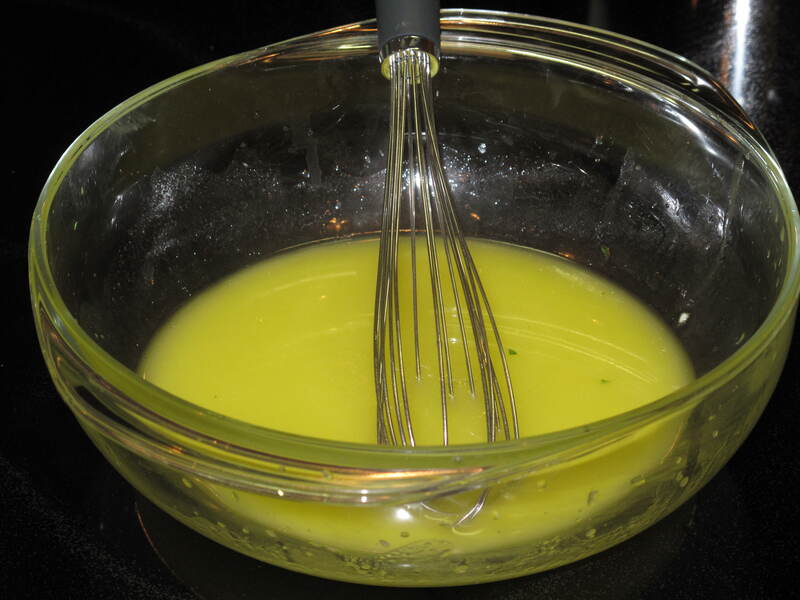 In another bowl, whisk together the olive oil, lemon juice and garlic. Set aside. 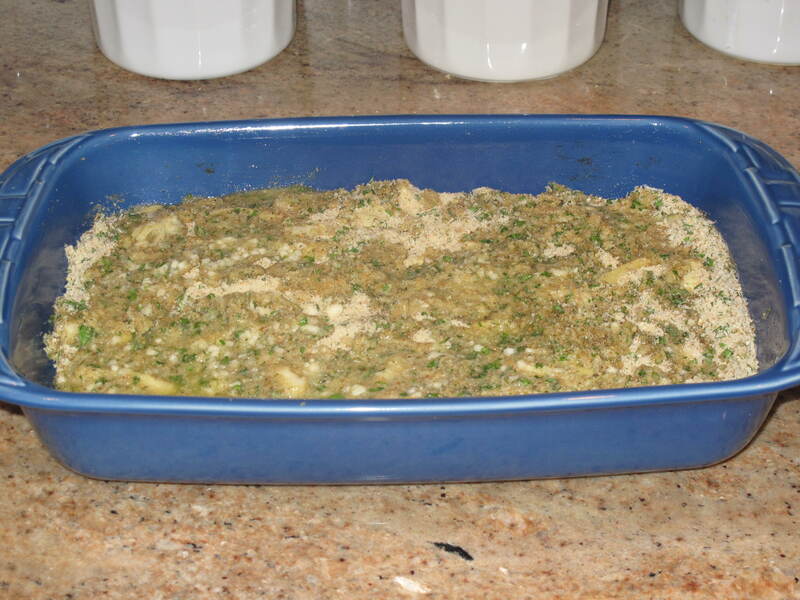 Rub olive oil inside a 13 x 9-inch baking dish. Lay the artichokes in a single layer in the baking dish. 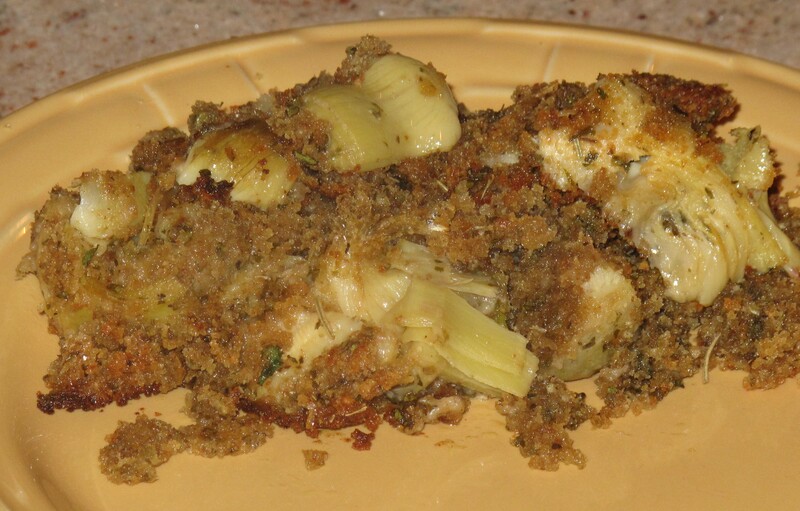 Evenly distribute the crumb topping over the artichokes, pushing it down in between the hearts. Drizzle the dressing all over the crumb topping. Cover the dish with foil and bake for 30 minutes. Increase the temperature to 375 degrees, remove the foil and bake an additional 10 to 15 minutes or until the top is golden brown all over. Simple, quick and really tasty. This is a nice dish to take to the table when you are pressed for time. In our quest to make all things Italian, this is a dish that gets high marks from even our harshest critics. So the next time you are in the mood for stuffed artichokes and don’t have the time (or the patience) to make them the old-fashioned way, give this quick version a try. What recipes do you have for artichokes that you make in your kitchen? 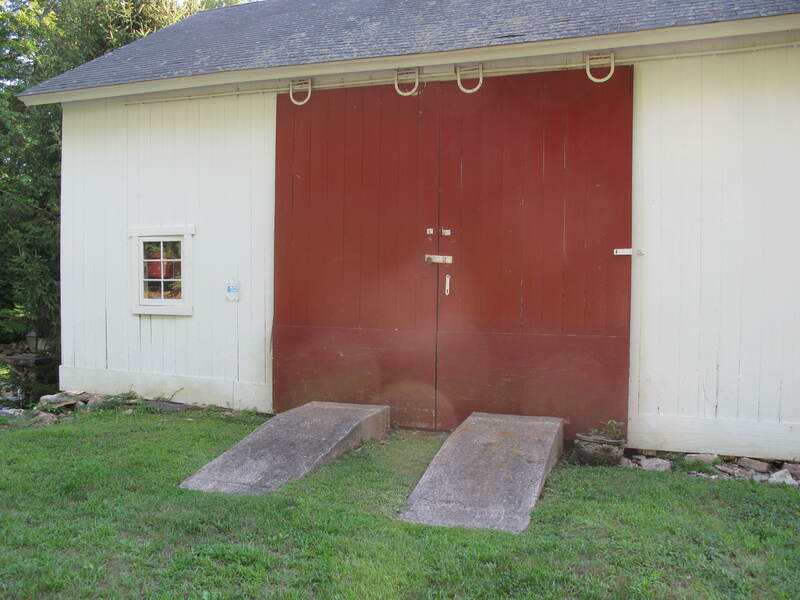 This is a picture of a barn in our neighborhood taken when the temperature was 94 degrees. A real barn burner, get it? OK, so some bad Summer humor. This was another little “find” that we ran across on one of our evening walks over the weekend. Next time we will have to see what is inside. Probably equipment of some sort, but let’s hope for something more exotic like a cow or a pig. Who knows? How are you coping with the heat this Summer?